MLNP: Flossy and Solomn MLNP owned Slide last night.. The "Flossy" launch party was so fun last night i wish it could have gone longer. Solomon killed it and it was fun to be able to play some more creative music @ Slide. 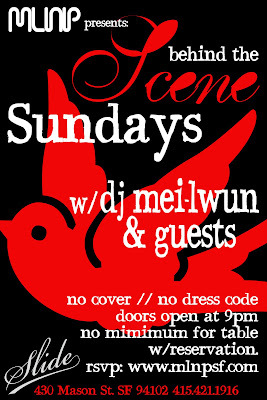 Don't forget we will call this Sunday @ Scene the continuation. On a bit more of a soulful, good times, hip-hop level, me and DJ Henroc will be dropping heavy cuts on you from 9pm-2am. RSVP to the facebook event and then become an MLNP VIP.